An inspirational instrumental live recording from June 1980, featuring Andy, Brian, Clive & Rick. 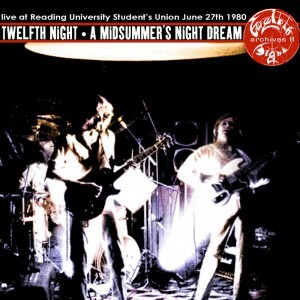 Recorded on a hot summer’s night at Reading University Students Union. Mark Hughes: “By June 1980, the band had become a tight performing unit having played more than 35 gigs since Rick completed the instrumental line-up in late 1979, the majority of them in the two months prior to this concert. The group was building a solid reputation around their home town of Reading with local gigs attracting sizeable audiences and nods of admiration from other local musicians. The set on this midsummer’s night was a mixture of material from the first cassette the band had released (in Jan 1979); the four tracks that would eventually materialise (with the addition of female vocals) as a second tape; and a ‘work in progress’ provisionally entitled After Office Hours, which most of you will recognise as an early version of East To West). As usual with soundboard recordings the ‘mix’ isn’t perfect, e.g. the enthusiastic audience are not as audible as they were on the day, but overall it gives a good indication of what it was like on that hot summer’s night”.